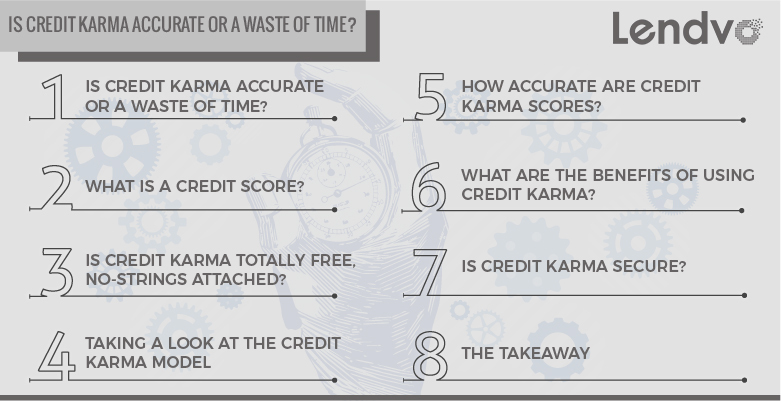 Home/Uncategorized/Is Credit Karma Accurate or a Waste of Time? Who doesn’t like free stuff? With Credit Karma, you can view your credit score for free when you sign up at their website. Sounds great, right? Well, yes and no. While it’s great that a company exists to help give consumers a glimpse of their credit score, one can’t help but wonder how accurate a free credit score can be. Also, what sort of personal information is required to calculate that free score? Are there proper security measures in place to protect sensitive information? How does a free credit score from Credit Karma stack up against a credit score from another creditor? These are all great questions to consider. But, first, what is a credit score? Before trying to determine the accuracy of Credit Karma credit scores, it’s important to know what a credit score is and how it’s calculated. In short, credit scores are simply numbers calculated using information from an individual’s credit report. They’re traditionally used to determine the credit risk of a person, something that determines whether someone is eligible for things like credit cards and mortgages. However, it’s important to note that the more accurate a number is, the higher a credit score will be. Equally important to note is the fact that only one type of credit score really matters, and that’s a person’s FICO score. What is a FICO score? Designed by the Fair Isaac Corporation, it’s commonly referred to as the gold standard in terms of actual lending. It’s known as the gold standard because it has been shown to be accurate enough for lenders to use to determine borrower risk. In fact, it’s one of the only credit scores that lenders use to determine a borrower’s credit risk. Depending on the risk level, a lender will either extend credit or refuse to extend credit. Since the emergence of the FICO score, other companies have attempted to create their own methods of generating credit scores, but FICO continues to lead the pack in terms of accuracy. This is one problem that Credit Karma faces. Because so many lenders only really take a borrower’s FICO score into account, other scores generated by credit companies like Credit Karma have a habit of being overlooked or don’t play a large role when assessing credit risk. Despite this, consumers continue to utilize Credit Karma, if for anything more than to get a general idea of where their credit score stands. Is Credit Karma Totally Free, No-Strings Attached? The answer is yes, Credit Karma is actually totally free. Unlike other companies that advertise access to a free credit score only to end up charging customers months down the road, Credit Karma never asks for a credit card, and it never charges for its services. So if it’s totally free, how does it work? How can it afford to offer such a valuable service to thousands of people? Credit Karma exists because it believes consumers deserve to know their credit scores. Why? Well, according to Credit Karma’s website, company leaders believe that if consumers are armed with such valuable knowledge, they’ll make responsible financial decisions, like paying bills on time. In Credit Karma’s mind, everyone wins when you know your credit score. You’re paying your bills like you’re supposed to, and companies don’t have to waste time attempting to collect on your debts. Sounds good, right? Not totally. You see, as a for-profit company, Credit Karma still makes money somewhere along the way. While you’re busy signing up to view your free credit score, Credit Karma is either strategically placing ads on the signup page to try to spur a response from you, or it’s creating more targeted ads geared toward your spending habits using information collected during the signup process. Essentially, companies pay Credit Karma to place ads on its website that are designed to lure you to their pages. So, don’t get too excited about that free credit score. You might be unknowingly trading personal information for that number, a number that might not even be very accurate. That brings us to our next question: How accurate is your Credit Karma score? Because free credit score services, such as Credit Karma, only take one or two scores into account when determining a credit score, it can be argued that Credit Karma scores aren’t all too accurate, and they rarely paint a proper risk assessment and comprehensive analysis of a borrower. However, that doesn’t mean Credit Karma scores aren’t accurate at all. After all, many factors contribute to the accuracy of a credit score, such as how often borrowers use credit. Other factors at play include a borrower’s total debt-to-income ratio and payment history. Borrowers with low amounts of debt and good payment history tend to have Credit Karma scores that are more accurate. On the flip side, if your credit profile is poor and you have a history of missing payments, your Credit Karma score is more likely to be inaccurate. Other factors, like having a short history of using credit, can result in an inaccurate Credit Karma credit score. Even people with long credit histories might have inaccurate credit scores if their debt-to-income ratio is too high or if they regularly miss credit payments. Because so many factors can influence the accuracy of a Credit Karma credit score, many industry professionals believe that free credit scores should only be used to monitor the activity of your score long term. For example, if your score is increasing over time, it’s highly likely that your FICO score is, as well. If your Credit Karma credit score is decreasing, your FICO score is likely decreasing, as well. Essentially, Credit Karma is a good way to get a general idea of where your credit stands at any given moment. Credit Spending: By signing up with Credit Karma, you’ll be able to track and monitor any credit card spending on your account. Tax Filing: Just recently, Credit Karma started offering tax filing services for free. So far, it’s a popular service, and more than 1 million tax returns have been filed through Credit Karma since the service was implemented. Credit Factors Report Card: This feature provides grades for each individual factor that goes into calculating a credit report, such as payment history, total accounts, credit inquiries, and more. If you’re trying to boost your credit score, this is all valuable information to know because it paints a picture of areas in need of improvement. Credit Monitoring: Credit monitoring is a great benefit that makes it easier than ever for you to catch any fraudulent activity. Because calculating a credit score requires sensitive information, like social security numbers, it’s understandable why so many worry about Credit Karma’s security. However, it should be noted that Credit Karma takes security very seriously. In order to protect sensitive data, the company has implemented many safety, security, and privacy measures, including a 128-bit encryption to ensure the information being transmitted to the Credit Karma website is secure. Additionally, Credit Karma is DigiCert certified and the company never sells customer data to third parties. As with many tools out there, there are pros and cons to using Credit Karma to view credit scores. While the company makes it quick and easy for consumers to access and monitor their credit score, the fact that a Credit Karma credit score is calculated using only one or two scores, like TransUnion, it’s very difficult to access a comprehensive analysis of a borrower’s credit profile and risk.